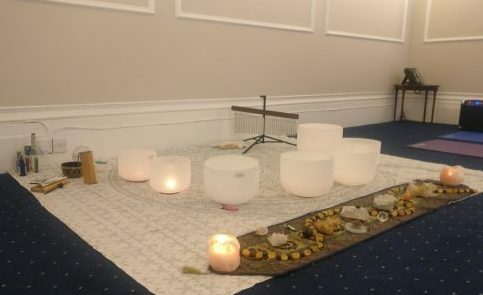 You’re invited to an evening to relax with beautiful sound healing and energy channelling with Himesh. This is an evening to relax and receive waves of energy through, sound, light and intention. Whether you want to reduce stress, work to relieve physical or emotional tension or just relax and receive on this event, this evening will serve your mind, body and spirit. Himesh will work with sound waves primary using crystal bowls to assist in clearing and integration for the energy body and all related physical and non-physical systems in the human condition. The sound vibrates at a frequency which can allow the systems to heal, release or grow. Himesh will channel energy transmissions and healing light to work on the energetic system. This works in conjunction with the sound healing to allow for a deeper and nourishing experience of love, healing, integration and relaxation. The evening will start with a short guided meditation to relax you into the space which will move into an hours long sound bath and transmission healing. We will finish off with a grounding meditation. Doors open at 7:00PM and the event will start promptly at 7:30PM. Doors will close at 7:40PM as once the meditation starts, we will not be able to admit any more attendees. Yoga mat, chairs and blankets are provided. Great evening, wonderful energy, sounds and healing vibrations. Great evening! The atmosphere was so peaceful. Perfect ending to a busy day. It was good to be in a group of people who are on the same page. What a powerful night! Thank you Himesh and everyone for being there and holding the sacred space! Big thanks to Himesh for the healing! Love and peace! Refunds are available up to seven days before the start of the event. Tickets may be transferred to another event hosted by Himesh up to 24 hours before the event. After this time, no refunds or transfers are available. Himesh has developed a structured and grounded spiritual practice which he has a passion to share. He loves talking about how to develop powerful spiritual structures and helping others find their own unique gifts. Himesh specialises in clearing energetic blocks, emotional trauma and mental obstacles in an all round energetic cleansing therapy. He is a master of energy flow and intuitively directs energy with a skill developed from a study of Eastern Mystical, South American Shamanic and Western Energetic spiritual practices.